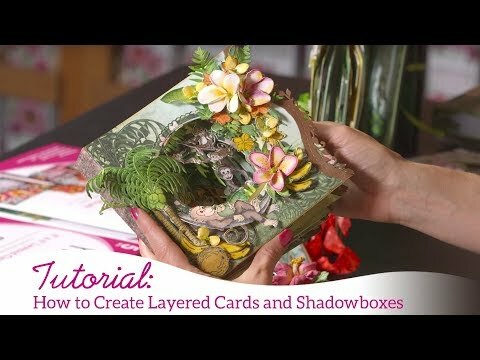 For more tips on creating with the layered card & shadowboxes, watch the tutorial at https://youtu.be/DrMIKI-XTmI. Instructions: Card base size is 5 x 7". Cut white cardstock to 10 x 7", score and fold at 5" on the long side to create a 5 x 7" top fold card base. Cut two pieces of paper from the Cherry Blossom Retreat paper collection 4 7/8 x 6 7/8". Ink the edges with Olive Green ink and adhere one to the card front and one to the inside. Cut paper from the collection 2x 4 7/8 x 4 7/8" and 4x 3/8 x 4 7/8" to cover the 5 x 5" shadow box. Use the Cut Mat Create 2A die to cut the opening in the front. Ink all the edges with Olive green ink and adhere to the shadow box using dries clear adhesive. Diecut the decorative die from the Daydreams Bridge set from white cardstock, sponge with dries clear adhesive and sprinkle with Rajni Chawla's Crystal Clear glitter. Stamp the Tweet Cherry Blossoms on Floral paper with VersaMark, sprinkle with WOW Sparkling Snow Embossing Glitter and heat set using the Heat it tool. Color with Pearlescent Coral ink, diecut using the coordinating die. Stamp the leaves on floral paper with Olive ink, color with leaf green and diecut with coordinating die. Stamp the birds on watercolor cardstock with VersaMark, sprinkle with Wow Metallic Silver Sparkle Embossing Glitter and heat set. Color with Zig Clean Color Real Brush markers. 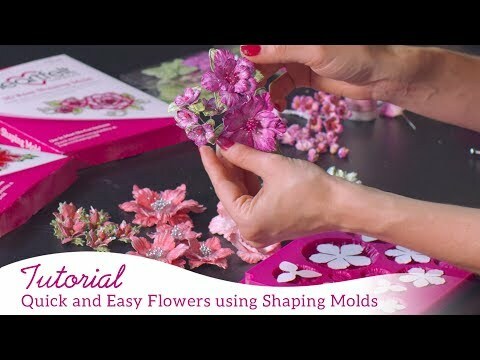 Place the flowers, leaves and birds in the Cherry Blossom mold, spritz with water and run through the diecutting machine. Finish shaping with Deluxe Flower Shaping kit. Pierce the flower centers, add stamens and use hot glue underneath the petals to set. Stamp the leaf sprays on floral cardstock using Olive ink, color using Leaf Green and Olive inks, diecut using the coordinating dies, spritz with water and shape using the Deluxe Flower Shaping kit. Sponge the leaf sprays and the leaves with dries clear adhesive and sprinkle with transparent crystal glitter. Stamp the bench on white cardstock using VersaMark, sprinkle with WOW Metallic Silver Sparkle Embossing Glitter and heat set. Adhere the leaf sprays and the cherry blossoms to the front of the shadow box as shown. Adhere the bench to the inside of the shadow box using dimensional dots along with two of the birds, a flower and a leaf spray. Adhere the decorative die to the back of the shadow box. Diecut two of the tags from the paper collection using the Tickets and Tags die and diecut two from white cardstock. Adhere the designer tags to the white cardstock for durability. Punch a hole in the tags and add green hemp. Adhere the tags to the right side of the card base and add some cherry blossoms and leaves. Adhere the decorated shadow box to the left side.